I wanted to cook up a quick meal, Laksa seemed like a good choice. Hadn’t gotten any chance to prepare the ingredients in advance (as I did my marketing of the day during lunch hour), I started to wash and peel the prawns, cut meat into thin slides and soak bean sprout, etc. Set them aside, I boiled a pot of water for making the soup base. Curry paste wasn’t difficult to make, but it required spare preparation time for the chopping, blending and frying processes. I disliked the pungent scent while having the spices cooked, too. It would stick on my laundry! :D So, curry or chilli flavoured dish was the only dish which I would usually cook with ready-made paste. It was faster, less hassle, and convenient, especially for those working mothers or beginners in cooking. 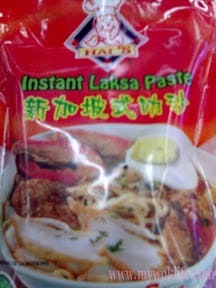 You might want to try this Hai’s Instant Laksa Paste (which good for 3 -4 person), which I used for this. 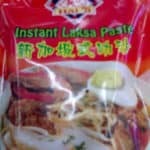 One thing, we surely wouldn’t really get to know what goes in the ready made paste. If you do read the ingredients listed on the pack, try going for no added preservative or MSG. That’s the least we could do. Anyway, coming back to my laksa dinner. It was for dinner, I surely wanted it lower in fat! How to when I also wanted to keep the addition of coconut milk? 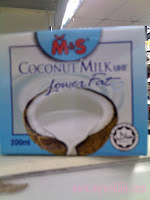 Not wanting any substitution of low-fat milk and soy milk, which many may normally think of as replacement, I used low-fat coconut milk (try this M&S brand in light blue & white colors box of 200g @ 80cents)! One more step I did to reduce fat is, divide the chili from its paste before adding into the boiled water. I knew it was bazaar, so don’t follow. Hahaha. The taste of this ‘low-fat version’ was just as great as the normal one, to me. But to be honest, the soup was much less fragrant. Haha. I used only half packet of the coconut milk, in fact (that was the reason why the colour of my soup wasn’t as milky and thick. So, go ahead to use whole packet since it is, low-fat). Oh well, the calories intake was a great difference, in this manner! Some articles claimed that coconut milk considers as high cholesterol food. If really so, it would then be a good reason to cut it down. Let’s see… Normal Laksa – About 585 kcal. Calories from fat – About 340 kcal. 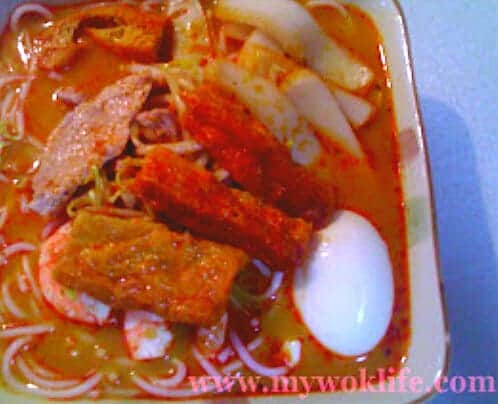 Low-Fat Laksa – About 415 kcal. Calories from fat – About 170 kcal. I thoughy, it was still worth the effort, even if the taste goes a little more bland, right? Unlike my last laksa dinner, I used thick bee hoon and yellow noodles (instead of just thick bee hoon alone) this time. I liked having hard boiled egg in curry sauce, too. So, I took another 2 min to boil 3 eggs. Waited to enjoy it with the laksa gravy. By the way, I couldn’t get cockles that noon. So, egg was our bonus. 1 cup of fresh cockles aka “Hum” (soaked in water to easily remove the meat from shell). 1. Boil a pot of water (abt 1000ml) and cook sliced pork/ chicken meat (easier to shred the chicken meat only after cooked when turned cool). Dish up. Then, cook prawns till pinked. Dish up prawns and keep the broth, shell prawns when cooled, and reserve. 2. Continue to boil the broth, add laksa paste, followed by coconut milk. Stir well. Reduce heat, and simmer for 20 min. Add fried tao pok into the laksa broth. 3. In another pot, hard boil the eggs, peeled when turned cool. Set aside. 4. Boil some water again (add pinch of salt into the boil), blanch bean sprouts and sliced fish cakes. Set aside. Then, blanch noodles. 5. Drain and divide noodles among bowls. Top the prawns, meat, fishcakes, bean sprouts on the bowls of noodles. Pour over hot laksa broth. Garnish and serve. In fact, this readily curry paste wasn’t really spicy enough. You have to add your own sambal, if you preferred extra heat. Would you like to try? This instant making Laksa took me about 30 min to get it served.